(AINA) -- A top secret memo sent by the Ministry of Interior in Saudi Arabia reveals the Saudi Kingdom sent death-row inmates, sentenced to execution by decapitation, to Syria to fight Jihad against the Syrian government in exchange for commuting their sentences. According to the memo, dated April 17, 2012, the Saudi Kingdom negotiated with a total of 1239 inmates, offering them a full pardon and a monthly salary for their families, who were to remain in the Kingdom, in exchange for "...their training in order to send them to Jihad in Syria." 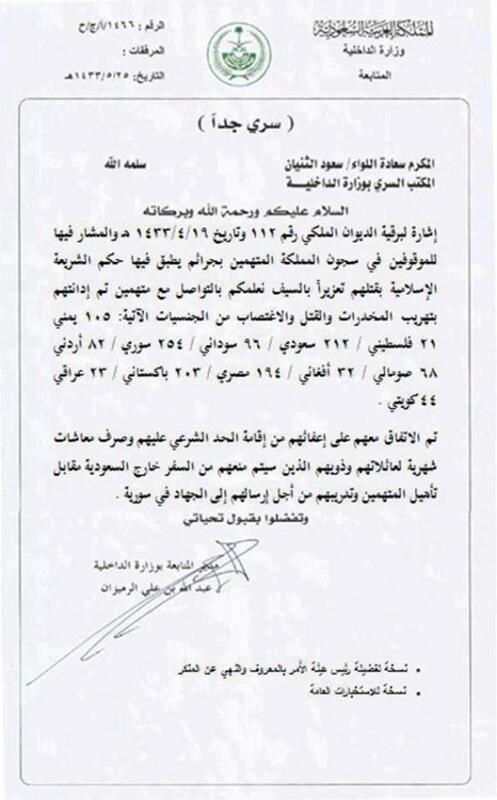 The memo was signed by Abdullah bin Ali al-Rmezan, the "Director of follow up in Ministry of Interior."